Today starts off the 3rd Annual Michael Fassbender Birthday Fundraiser to support The Bike Experience. We have successfully raised nearly £2,500 in the past two years at the Just Giving website. Your donations can be made at this year’s Just Giving Fassinating Fassbender page, and as always, your money goes directly and immediately to The Bike Experience (TBE). Throughout the entire month of March, I will post regular reminders about the fundraiser to keep the awareness level high. I believe that if we start off strong, we’ll end the fundraiser strong and finishing well past this year’s goal of £1,100! I have been so impressed and inspired by the FF community's donations in the past, and it means a lot to me that people plan to give again this year. Everyone works very hard for their money, so when people make a donation to this fundraiser, they are firstly doing it to honor the person we're here for: Michael Fassbender. And secondly, they are making a charitable donation to an organization that they believe in and have been inspired by for the past two years. I’m pleased to be able to offer a raffle prize to one lucky winner. And if you by chance happen to make more than one donation during the 33 days of the fundraiser, your name will be added to the raffle that same number of times, increasing your chance of winning the raffle gift bag prize from Real Irish! If you make two separate donations, you’ll be entered twice; if you make three donations, you’ll be entered in three times, etc. I think in the first year, one person made several donations sprinkled throughout the fundraising period. Everyone who makes a donation will have their name added onto a birthday greeting announcement that will be presented to Michael for his 38th birthday on April 2nd! Help spread the word about the fundraiser, or collect a few bucks from friends and family, and you can submit each donation under your name to increase your raffle chances for the raffle prize! Forward the video interview featuring TBE Founder, Talan Skeels-Piggan to friends, or post it on your Facebook, Twitter, or Tumblr accounts and feature a link to the FF Just Giving page. 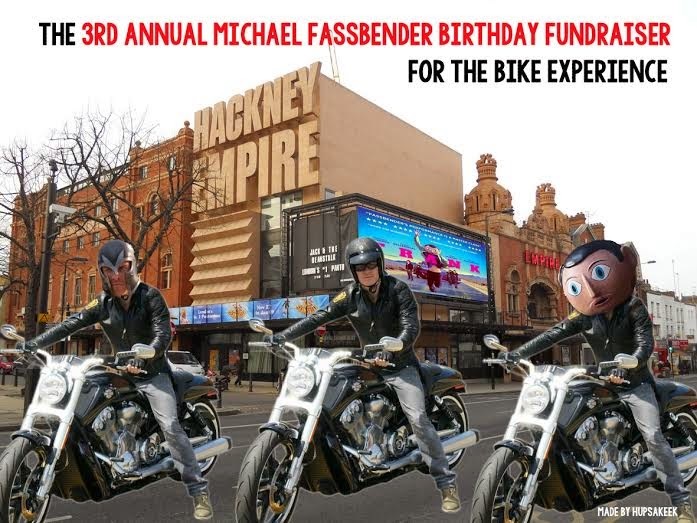 The more people who know about the fundraiser and the more you bring awareness about the fundraiser’s connection to Michael Fassbender’s birthday, the more successful the fundraiser for The Bike Experience will be. And remember, every single dollar, pound, and euro goes a long way! If we raised £1,097, that demonstrates the importance of one person donating the minimum of £5. The more the merrier, but when it comes to charities, every penny counts! So please give what you can, when you can. Thank you all so much for your help and support this year! We got two donations before my end of a long day at work! Thanks Vera and April! Thank you for your donation Marjan, we're already at £122! Woohoo!!! !